Begoña is one half of New York's producer and DJ duo Sleepy & Boo, and she is proudly making her solo recording debut with the Horizons EP on 3Bridge Elements. Featuring three beautiful tracks, the Horizons EP reveals a new side to her sound, as she explores downtempo and chilled-out Balearic rhythms and vibes for the 3rd release on Elements. This music is an extension and evolution of her Meditation Soundtrack Paths, her 20-minute audio explorations into stillness and sound healing, that she has released on Soundcloud over the last year. Begoña is no stranger to music, and Sleepy & Boo have put out many great works via our parent label, 3Bridge Records and many others! 'Distance' starts this release off smoothly, evoking a classic downtempo, trip-hop vibe. Anchored by a dusty breakbeat groove, soft pillows of pads shine through as subtle melodics enter in and out of the mix. Gentle arpeggios, percussion, and echoed angelic voices glue everything together, while an emotive two-chord progression creates a hypnotizing atmosphere that enables a state of blissful relaxation. Scarlet sunsets and cool mountain breezes are the vibe here. The second track on the EP 'Vista' pitches things down a bit, as Begoña crafts a heady, simmering groove. This track embraces the hot haze of summer, with organic percussion prominent in the mix, as a steady kick and snare provide the rhythmic foundation. This composition seamlessly merges together a standup bassline, swirling keyboard leads, inspiring strings and dub delay washes, with lush chords. 'Vista' is truly a production that will remain in your consciousness. 'Horizon' closes out the EP with an uplifting and empowering march to the morning. This track cruises along with a slow and steady 4/4 beat, a chilled-out deep house tempo that balances out the rest of this release perfectly. 'Horizon' builds to an euphoric crescendo, with a haunting piano melody that resonates thoroughly in the listener. You can't help but envision a beautiful beach-side sunrise as this plays, making this track the perfect early-morning selection, the kind of 'one last tune' a DJ might reach for to end an unforgettable night. All together, these three tracks compliment each other admirably. 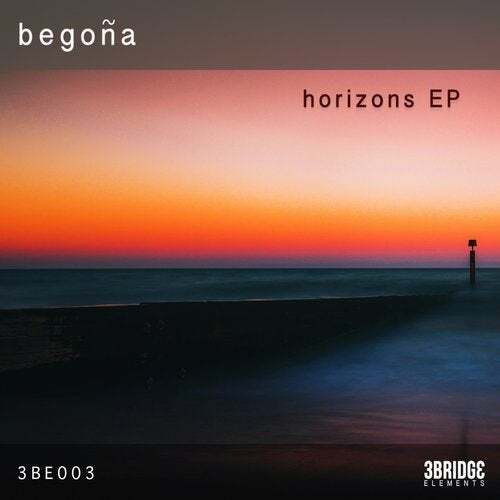 The Horizons EP is a seamless and brave venture into sound, and we're excited to welcome Begoña to 3Bridge Elements with this release.